I hope all of you that celebrated Thanksgiving had a wonderful holiday. We had a small group for dinner and it was a very nice day. The Wednesday prior was a snow day for the local schools so Julia’s weekend was even longer than expected. We didn’t get as much snow as was forecast but what a treat it was. Ray, Julia, and I went up to Downieville for the rest of the long weekend. Julia brought a friend up too. On that Saturday we got a text from my middle son, Kyle. Big news! He proposed to his girfriend of five years and she accepted. They are perfect for each other and we couldn’t be happier to have Marisa join our family. The gorgeous picture at the top of the page was taken by Ian (my youngest son) on a recent vacation he had with Kyle and Marisa. 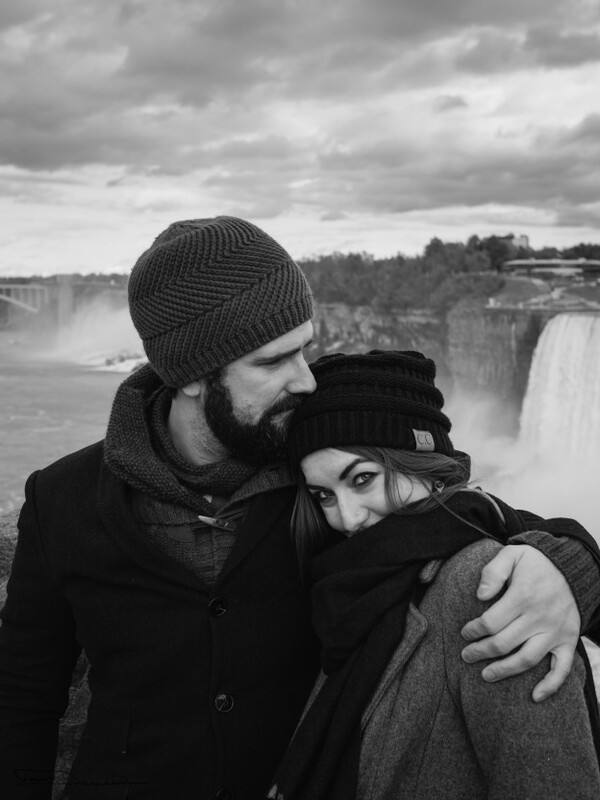 In this picture they were at Niagra Falls. To his credit, he did ask me on multiple occasions if I wanted him to clear a path to the sewing machine. There wasn’t time for it anyway so it was not a big deal. Last night when we got home from Downieville I decided to cut into a piece of fabric I bought last week. I was at Jo-Ann Fabric and had one of their always-welcome “20% off entire purchase” coupons. Those make me a little crazy. I bought some practical items that I needed for my Etsy shop and then decided I wanted to make a new bathrobe. Prior to my current quilting obssession, I used to sew clothing fairly often. A long while back, I wrote a post about this. Like quilting, garment sewing is a fairly expensive hobby. More often than not, I can buy the ready-made garment for less than I can sew it. But again like quilting, it is more fun to make it. 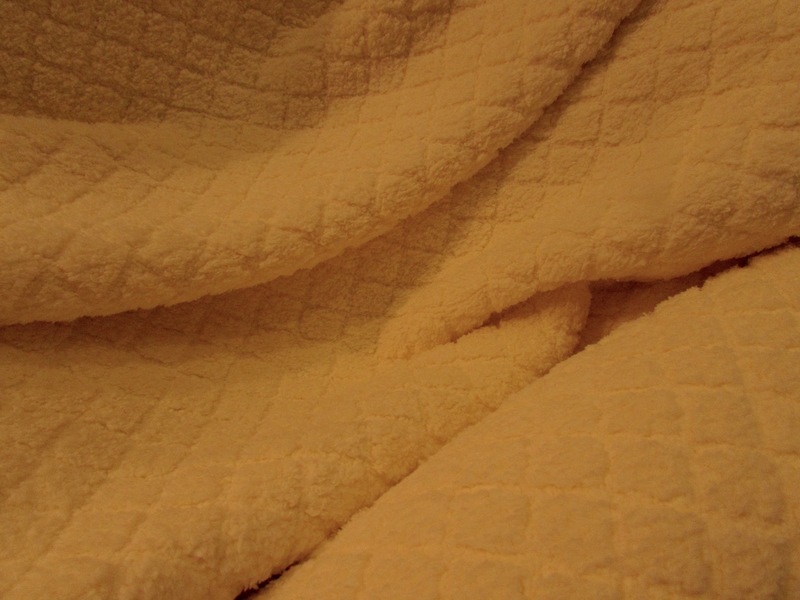 I found this wonderful, soft buttery yellow fabric. With my coveted coupon and the fact that it was already on sale, the expense for the fabric went from $55 to $33. Not too shabby. 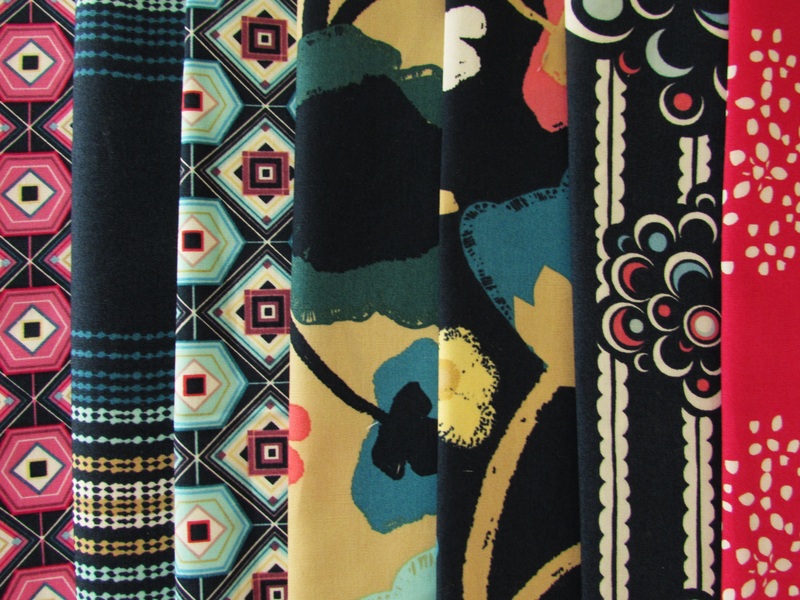 I knew I would be able to find a pattern to use in my pile of old patterns. This one was missing the pieces to the PJ pants but still had all of the pieces to the robe. It is date stamped 1989 so yep, I have had it around for a while! Isn’t that couple just dreamy in their matching robes? Too bad I didn’t think to buy enough of the yellow fabric to make Ray a matching robe…… 😉 I got the pieces laid out and cut last night so I am ready to go. (Well, maybe I should vacuum first. I cut the pieces in my dining room because I was working with a four yard length of fabric. There is yellow fuzz floating around throughout the house now.) This bathrobe consists of a few long seams and putting two pockets on the front so it will come together quickly. I’m looking forward to working on it. 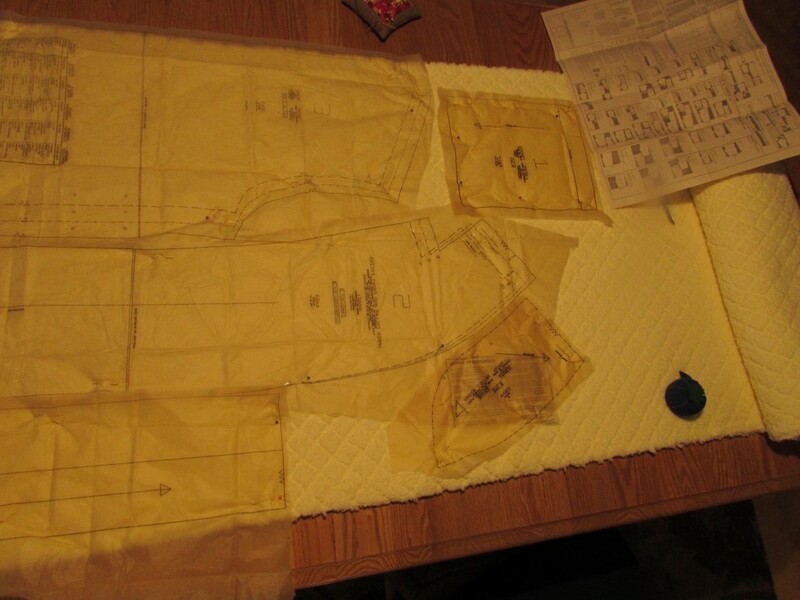 Sewing from a pattern is something that I have done for so long that I don’t really have to think about it. 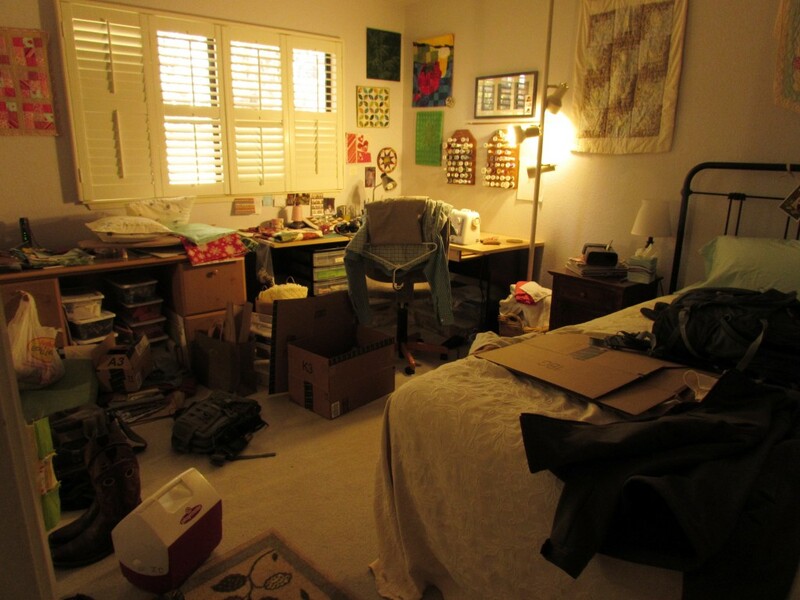 It is mindless sewing – as compared to quilting where I have to watch myself all along the way. In fact, this will come together fast enough that I will call it my December goal for ALYOF. I didn’t set a goal at all in November and didn’t meet my goal for October so it is time to get back on track! Linking to Molli Sparkle’s Sunday Stash, ALYOF at Sew Bittersweet Designs as well as Sew Cute Tuesday over at Blossom Heart Quilts. 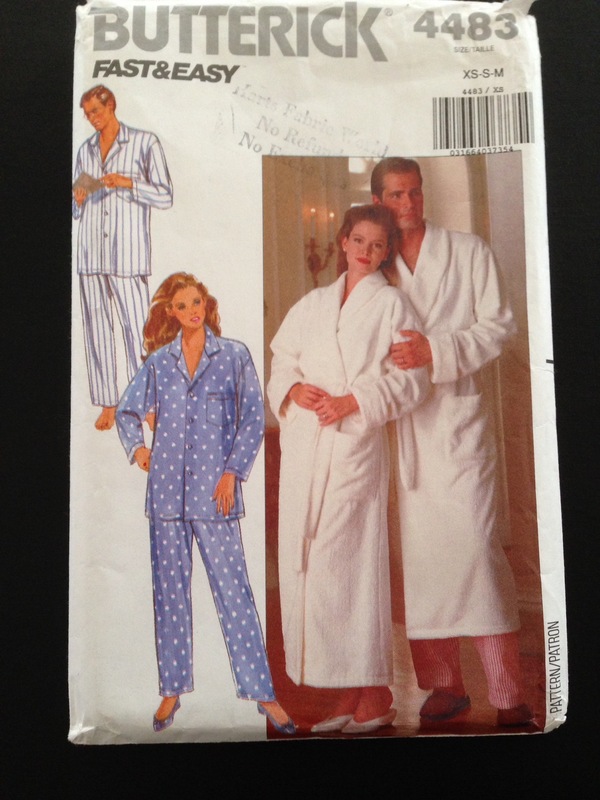 This entry was posted in ALYOF, Family, Garment Sewing, Stash and tagged bathrobe pattern, family, garment sewing, stash on November 30, 2015 by Bernie. Just a quick post to wish everyone in the US a very Happy Thanksgiving. For those that don’t celebrate the holiday, I wish you all the best as well. So, who is cooking and who is not? This year I will be cooking, along with my husband. I have a 20 pound monster of a turkey in the fridge and all of the ingredients for everything else. At least I am fairly sure I do. After seeing the craziness in the market yesterday, I can say for certain that if I don’t have it by now, it won’t make its way to the table. Thanksgiving is my favorite holiday. We have so much to be thankful for and it is wonderful to have a day to enjoy family and just be grateful. For us, the day tends to be centered around food and family which are two of my favorite things! About two weeks ago I was browsing Pinterest looking for ideas for the table this year. 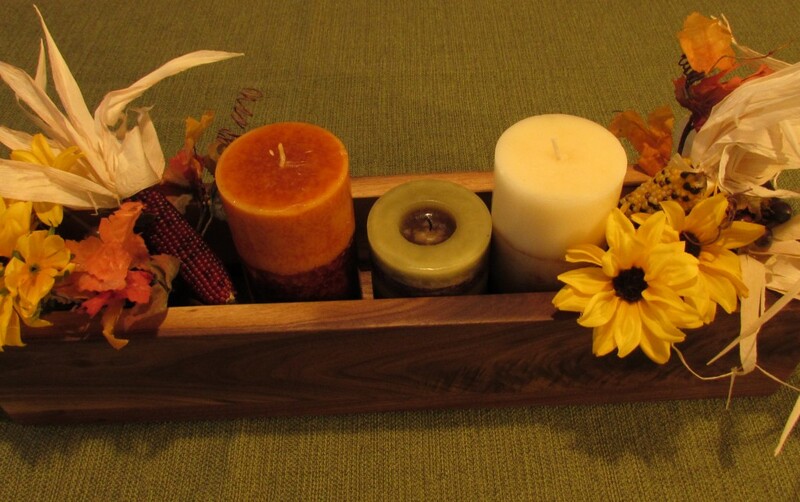 I found this simple wooden box filled with candles and small, decorative pumpkins. I showed the picture to Ray and asked if he might have time to make one for me. The following weekend he came through with his version and it far surpassed the picture I had shown him. 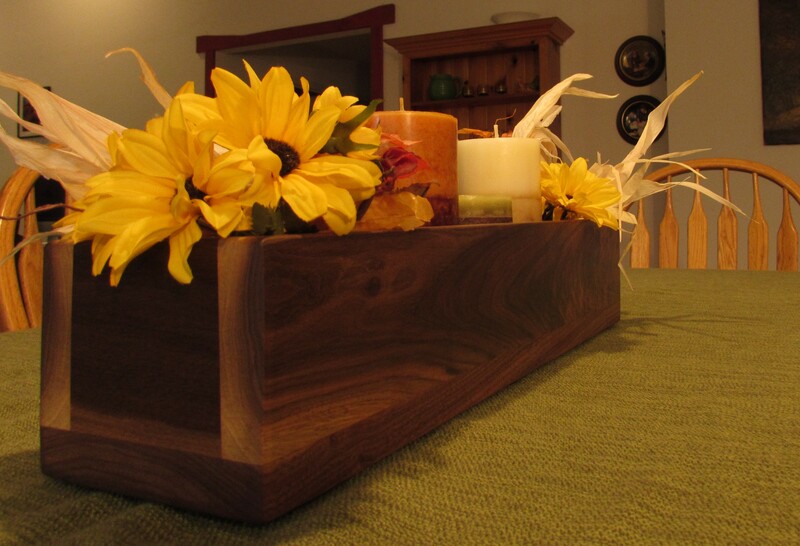 The wood is the most gorgeous walnut. He had a number of scraps left over from a table he was commissioned to make for my sister last year. I am so happy with it. I love it with these autumn colors. I look forward to using this piece over the years. 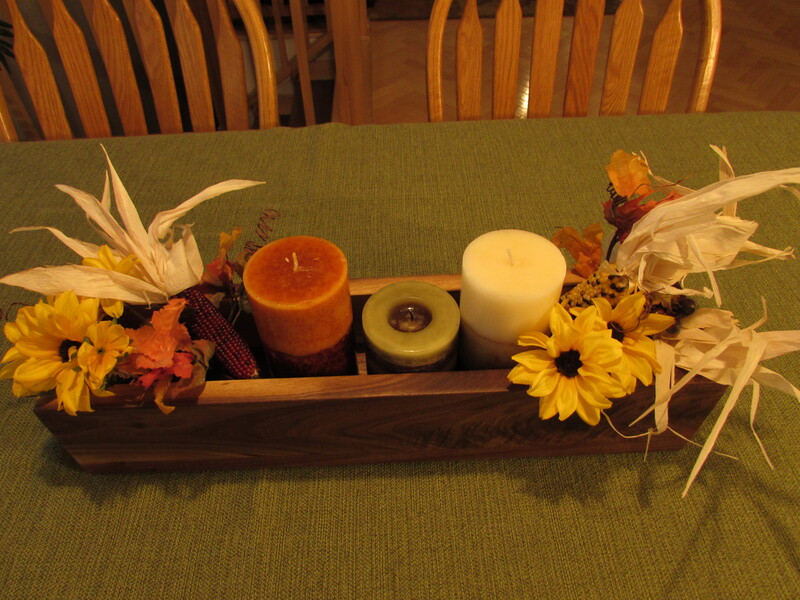 It is like a blank slate and can be decorated for any holiday. It is pretty awesome having a creative guy and it is fun to have this in common with him. I hope each of you are able to spend time with your friends or family and celebrate all that we have to be grateful for. Thank you for your virtual friendship – I so enjoy our community. Linking with Ladybug Blessings, a link up for handmade craft. 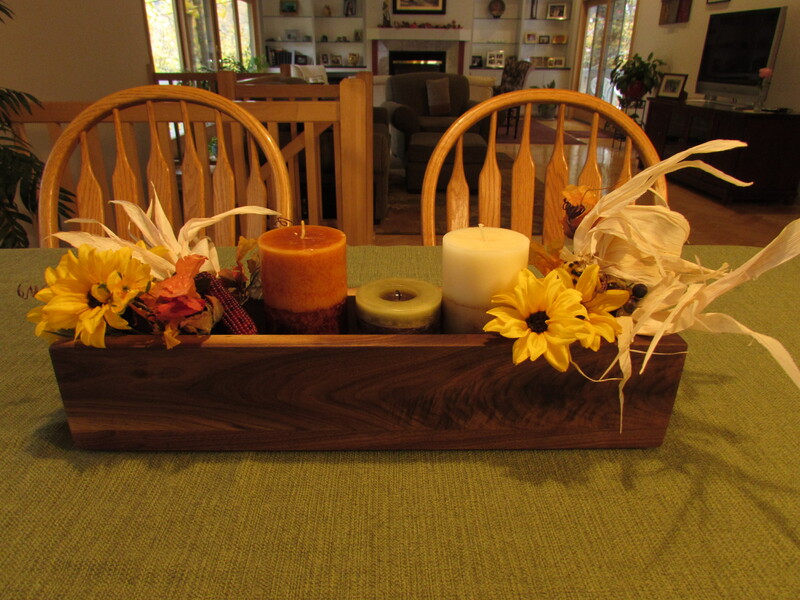 This entry was posted in Family, Gratitude and tagged tablescape, thanksgiving, walnut box on November 24, 2015 by Bernie. I can now say I have my first fabric challenge under my belt. This was a fun, though somewhat intimidating project and it feels good to have finished it. Overall, I am very pleased with the result. Remember I used a portion of a pattern I purchased from Oh Fransson (ElizaTbeth Hartman) called Tokyo Subway Map. You can read more about this project here. What do you think? I love the red with the Michael Miller Glitz fabric. 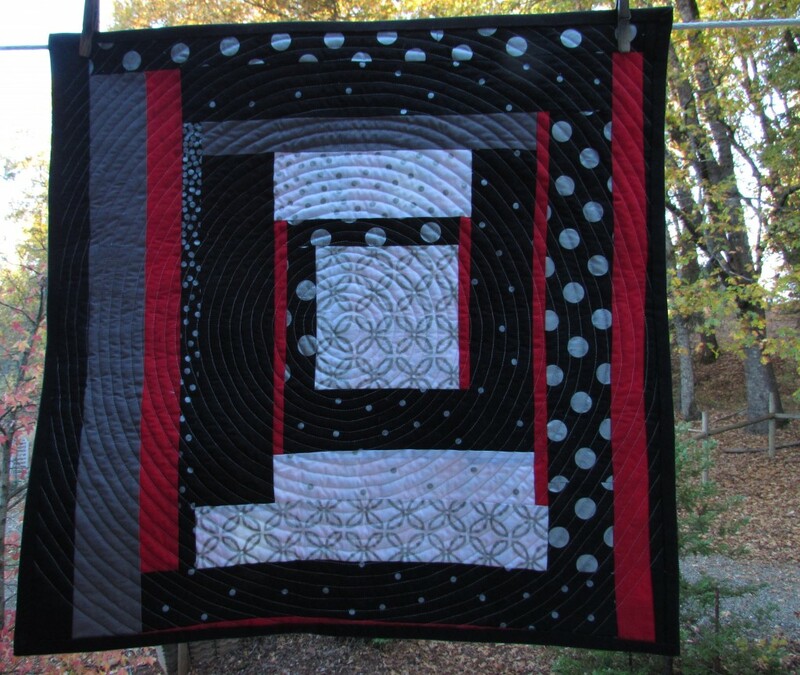 It makes for a bold and festive quilt. The spiral quilting was a breeze. I practiced once on some scraps and then I went for it. Using a walking foot and Aurifil thread, only the first spirals in the center were challenging. After that, I just followed along the previous spiral with the edge of the walking foot. 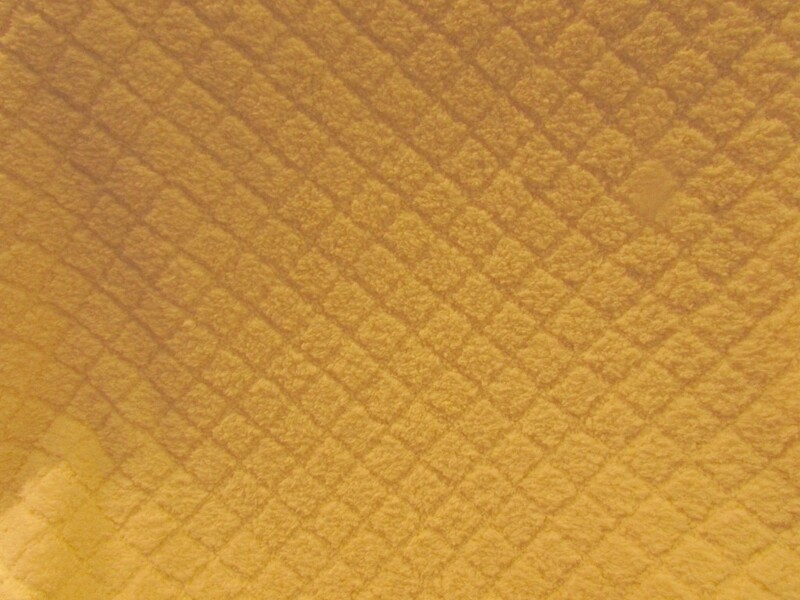 It was quilted in no time at all. I went in concentric circles as far out as I could. When I hit the edge, I echoed out through the corners. Basic black made a great binding. I thought about using my leftover Glitz fabric and creating a scrappy binding but this quilt is busy enough as it is. Black toned things down a bit. Joining the ends of the binding strips tends to make me a tiny bit crazed so I looked at a tutorial from Rita over at Red Pepper Quilts. Ta Da! It worked and my binding lay flat and fit perfectly. Thank you Rita! I used just about every last scrap creating the backing. I really like the back side and consider this mini to be reversible. 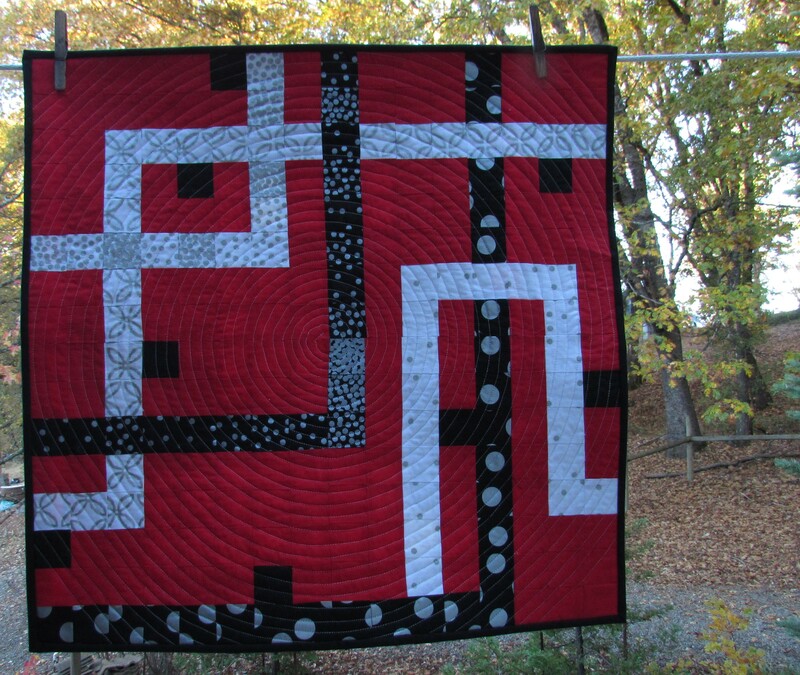 All finished, the quilt measures at 24″ x 24″. I will submit this to QuiltCon as part ofparticipating in the Michael Miller Fabric Challenge is the stipulation that each of us enter our project for consideration for QuiltCon. 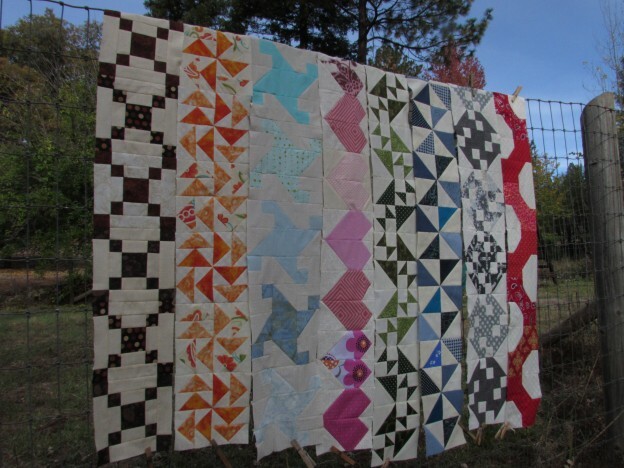 I took some time and listened to some webinars hosted by the Modern Quilt Guild for tips on entering quilts. I don’t have huge expectations about this being accepted. I have seen some pretty amazing projects on Instagram and there are more that are not yet being shared. But it feels good to get this project under my belt as a way of testing the waters. 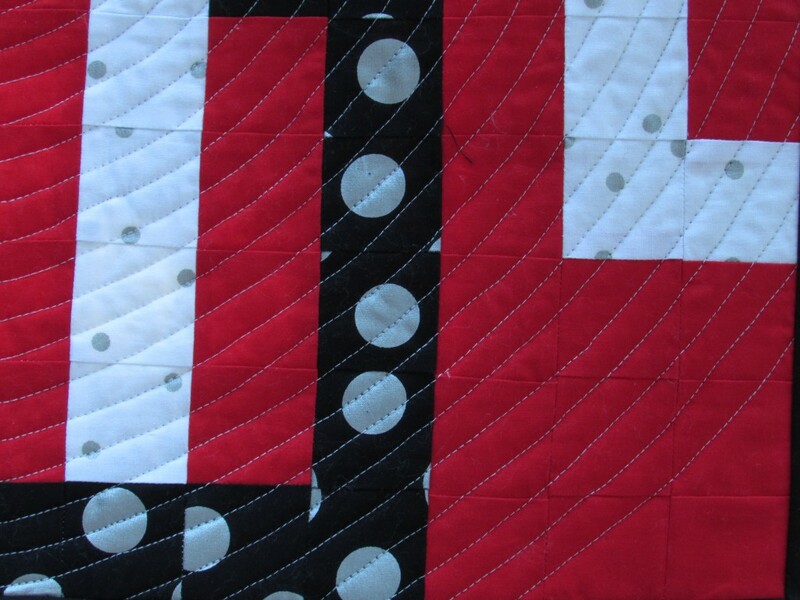 There are a few spots that are less than perfect and I don’t think that the quilts that are accepted have corners that don’t match up. Like the one below. Sigh. I am ok with it. Overall, it looks good and I really like it. This has been a great learning experience. I will certainly do it again, if the opportunity presented itself! Now, what to work on next….. Probably the blocks for the last row of my RSC15 project. November is quickly coming to a close!! 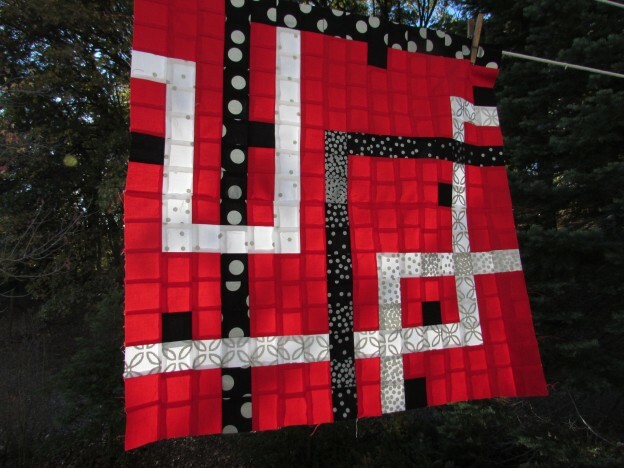 Linking to Crazy Mom Quilts. Links are at the top of the page, under Link Ups. 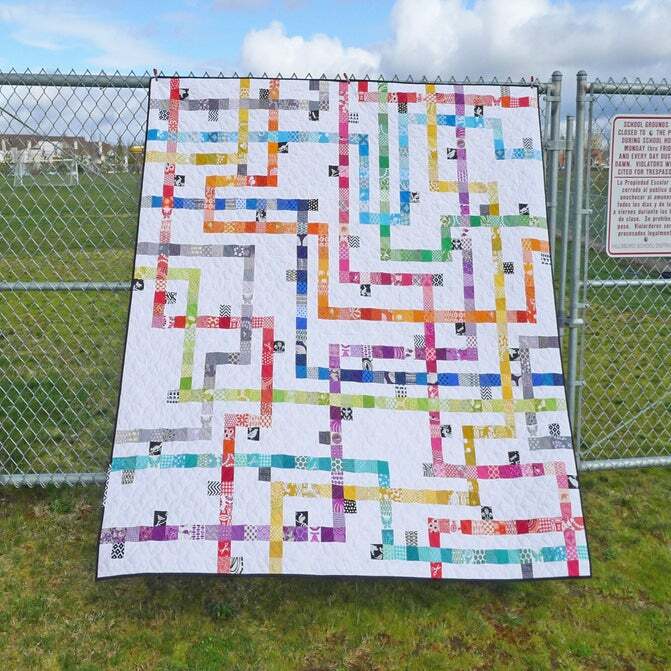 This entry was posted in Fabric Challenge Quilt, Mini Quilt, Modern Quilting, Spiral Quilting and tagged Glitz fabric, michael miller fabric challenge, modern quilt guild, QuiltCon, tokyo subway map on November 20, 2015 by Bernie. 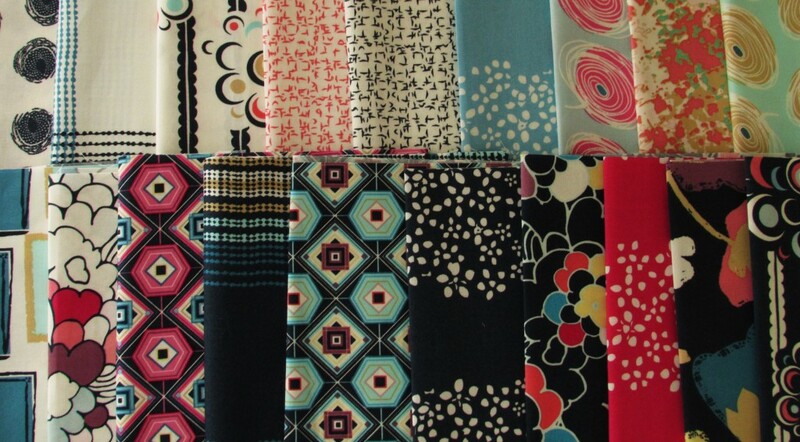 My fabric arrived in July last summer. At first glance, I wasn’t too wild about the prints. There is a whole lot of shimmer in this fabric. I quickly ordered some solids (gray, red and black) to tone down the collection. The gray turned out to be a bad match. It was very flat when paired with the fabrics. The red and black work fine though. After receiving all of the fabric, it sat on my sewing table for weeks. I kept looking at it and trying to figure out what I wanted to make. I was feeling less than inspired. Time was moving along and I knew I had to get this figured out. Luckily for me, my sister Patti was in town two weeks ago and she was a great help. She has a great talent for design and decorating. I pulled out the fabrics and we started going through my Pinterest boards. Talking through this with her, I decided to make a mini that was angular, with a sharp pattern. It didn’t take too long to decide to use the Tokyo Subway Map pattern, designed by Elizabeth Hartman. I purchased and downloaded it right then. Can’t beat the instant gratification of internet shopping! This is a great pattern that I have admired for quite a while now. For this immediate project, I decided to make four of the blocks from the pattern, using 2 1/2″ squares (which is smaller than what the pattern calls for.) 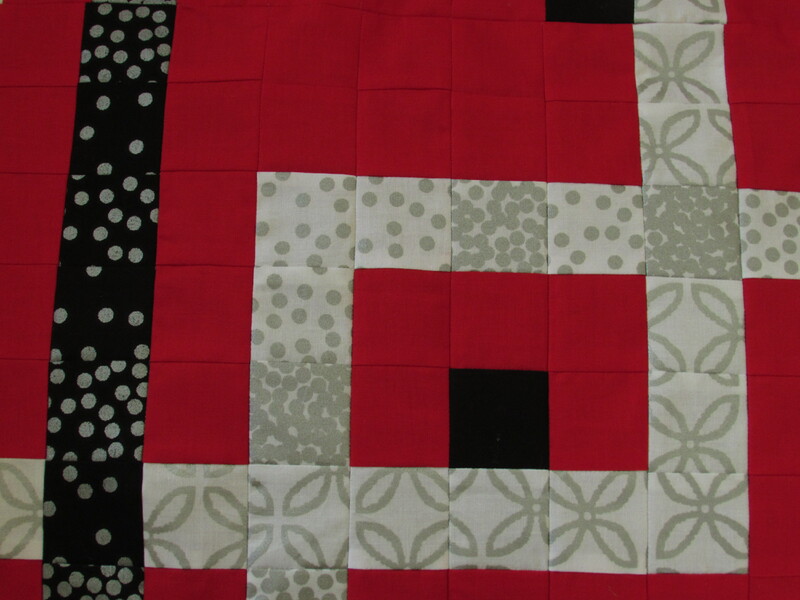 Reducing the size of the squares made it possible to make my quilt finish out at 24″ x 24″. I love the bright red background with the black, silver and white prints. I know I can rely on you guys for input. Feel free to give me an opinion. The other issue is time. I need to have this completed and photographed by November 30. All participants are required to submit photos of their project by the last day of November. Hope you are all enjoying Autumn. We Californians are totally loving the rain that we have been gifted with over the last couple of weeks. They are forecasting for more over the weekend. Yahoo! Linking to Amanda Jean over at Crazy Mom Quilts as well as Sarah from Confessions of a Fabric Addict. 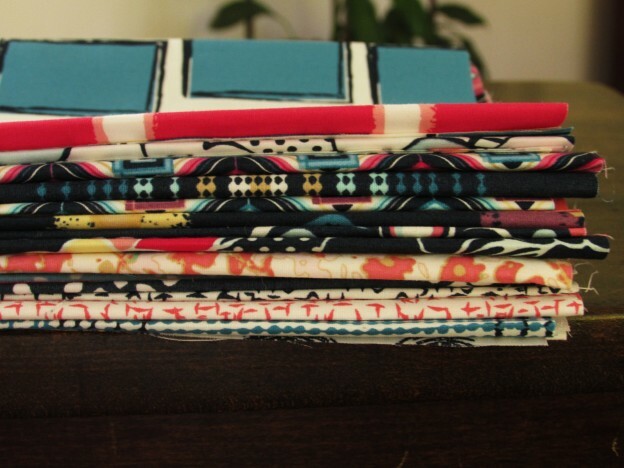 Link ups to these amazing quilters are available at the top of the page, under Link Ups. This entry was posted in Fabric Challenge Quilt, Mini Quilt, Modern Quilting and tagged elizabeth hartmann, Glitz fabric, michael miller fabric challenge, modern quilt guild, Tokyo subway map quilt on November 12, 2015 by Bernie. It seems like it’s been a while since I posted a finish. But I have one this week! Getting back into the sewing room has been so nice though it took me a while to really get going. I decided to make the October blocks for my Classic Stitches row quilt. Being so close to the end of this project, I didn’t want to get too far behind. The color for October was brown for RSC15. 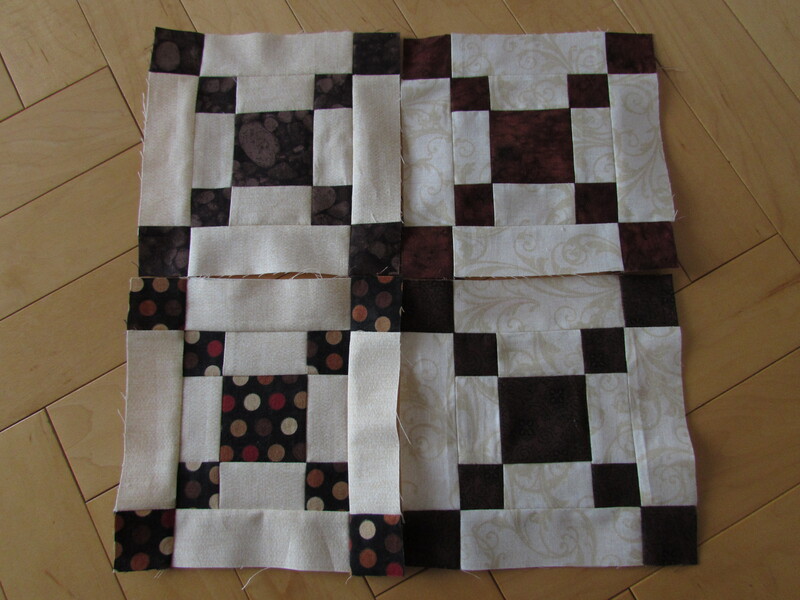 The block that Mari chose for October was the Pennsylvania block. I think this was in honor of her recent move from Wisconsin to Pennsylvania. It worked perfectly for me too. I have a strong fondness for the state of Pennsylvania. When my boys were little guys, we lived there for two years. We were in State College and I loved everything about that town. So making a set of Pennsylvania blocks was perfect for me. Isn’t that a cute row? So traditional. Much like I thought State College was. I remember thinking it seemed like everything was more grounded, more down to earth in State College, as compared to living in California. 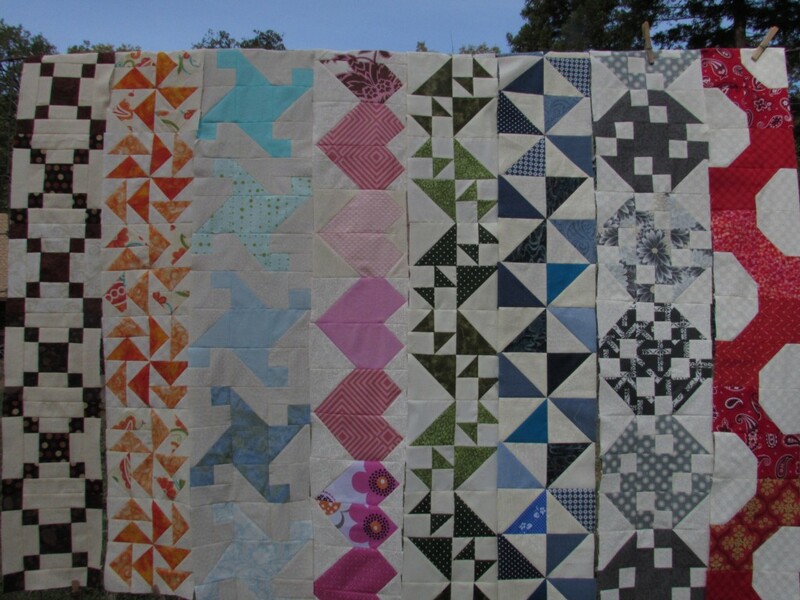 The row fits right in with the other rows of classic blocks that I have made this year. At this point, I have ten rows completed. (For some reason, I didn’t grab the purple or the yellow rows when I went outside to take pictures. So, they aren’t shown here.) My next decision is whether or not to make the November row. 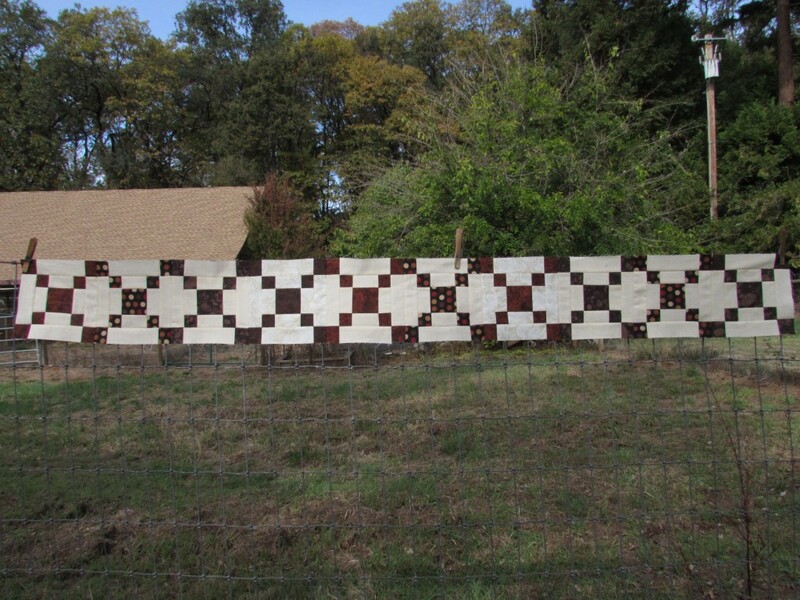 With these ten rows, I have 62 inches in length (two of the rows are 7″ blocks and the rest are 6 inches.) I am going to sash the rows because my not-so-precise sewing style means the blocks won’t line up perfectly and that can be disguised with some sashing. This will add a bit more length. How long do I want this to be? (It will be 60″ wide.) Any ideas??? The week buzzed by and I am happy to have this checked off the list. My Etsy shop is getting busier and I need to make a few more things for holiday shopping so that jumps to the top of the list now. 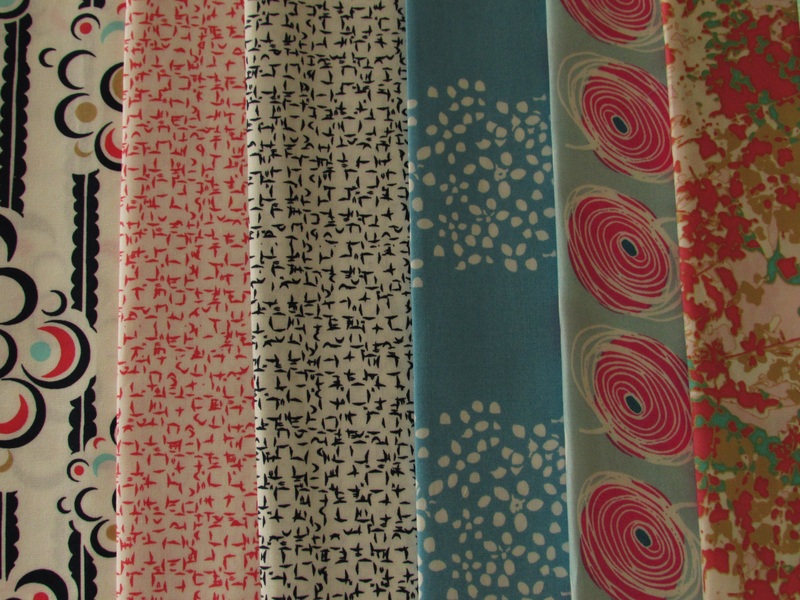 Along with that is the Michael Miller fabric challenge that I am doing with the Modern Quilt Guild. That project is due on November 30th so I need to get cracking on that. It is well underway and I am sure I will have a post for you with pictures sometime next week. Linking to Amanda Jean over at Finish It Up Friday. 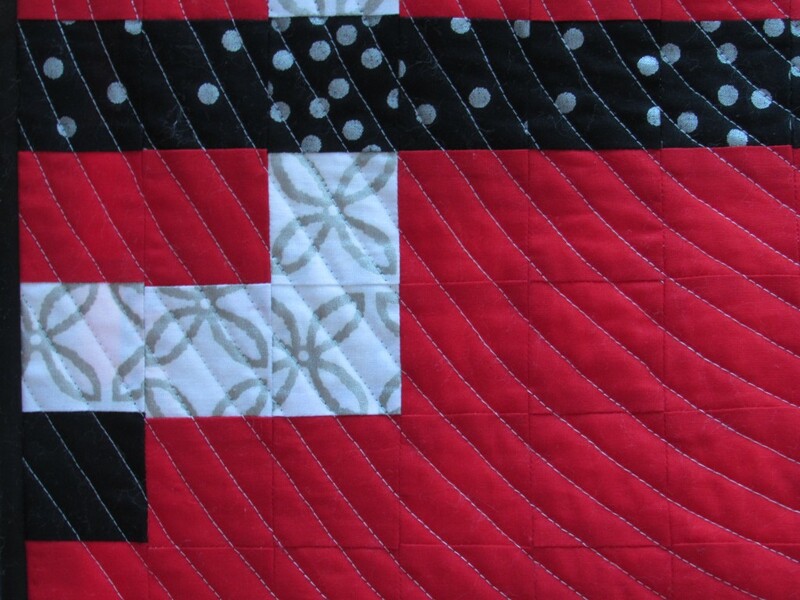 This entry was posted in Etsy, Row Quilt, RSC Challenge and tagged Classic Stitches BOM, pennsylvania quilt block, RSC15 on November 6, 2015 by Bernie. You know that feeling when you have been down with a bug for a while and you finally feel better? That happy feeling of being able to have normal days, doing normal things? And it feels so good to just be back to normal? Well that is kind of how this week feels. 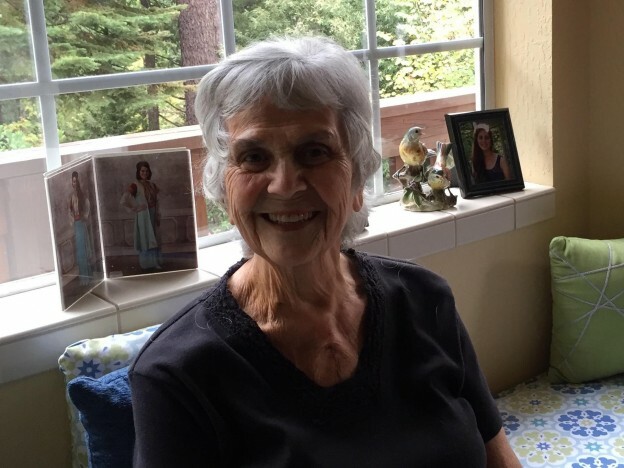 It has been three weeks since Mom’s heart surgery. This week she has made some really big improvements and is feeling so much better. She looks wonderful and is up and doing little things here and there. Consequently, we all feel better! I don’t know if this is how all families are, but when one of us is down, we each have this sympathetic /empathetic thing that causes the rest of us to be down. And we know this about each other. When Mom was in the hospital, moving from bed to chair to walker was intense. It was so hard and it really hurt. The first couple of times the nurse came in to tell her it was time to get up and move from chair to bed, Mom would tell us to leave the room for a minute. She would say, “If you watch, you’ll hurt too. No need for that.” She knew how hard it was for us to be watching her. But now, three weeks later, she is on the road to recovery and looking great. Such a relief! We are endlessly, completely grateful for her good health. Today I did normal stuff. Enjoyed cleaning my house and catching up on laundry! (Pretty exciting, right? Honestly, it was.) 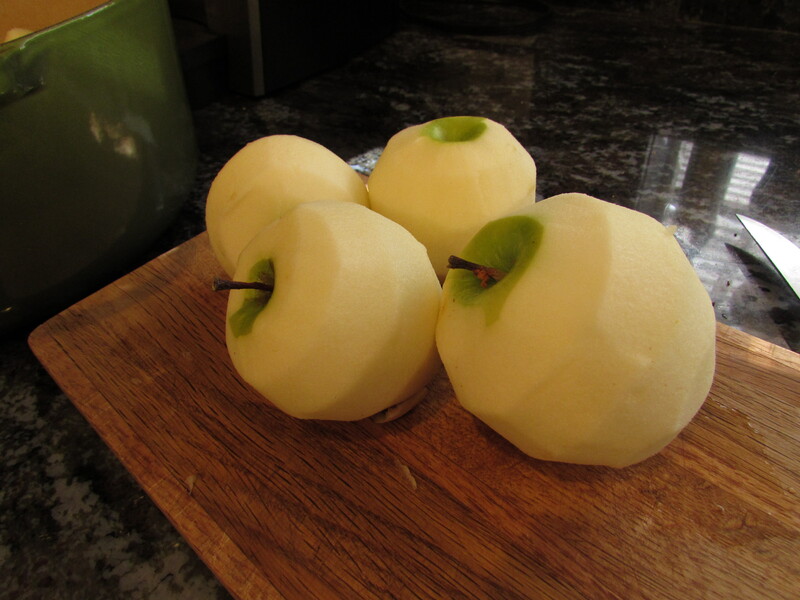 I also decided I had better do something with the apples that have been sitting in my basement for more than a month now. My in-laws have a small apple orchard and we went and picked apples a long while back. 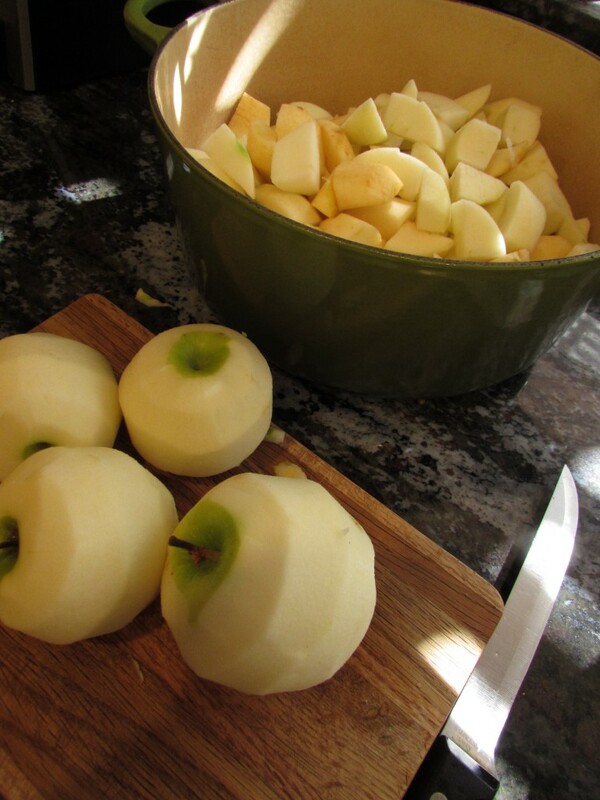 I made a large pot of applesauce with the last of the apples. Yum. Our family loves homemade applesauce, chunky with lots of cinnamon. Even our hens were happy about this. They get all the scraps. Lucky girls. I have also been back in the sewing room. Finally! 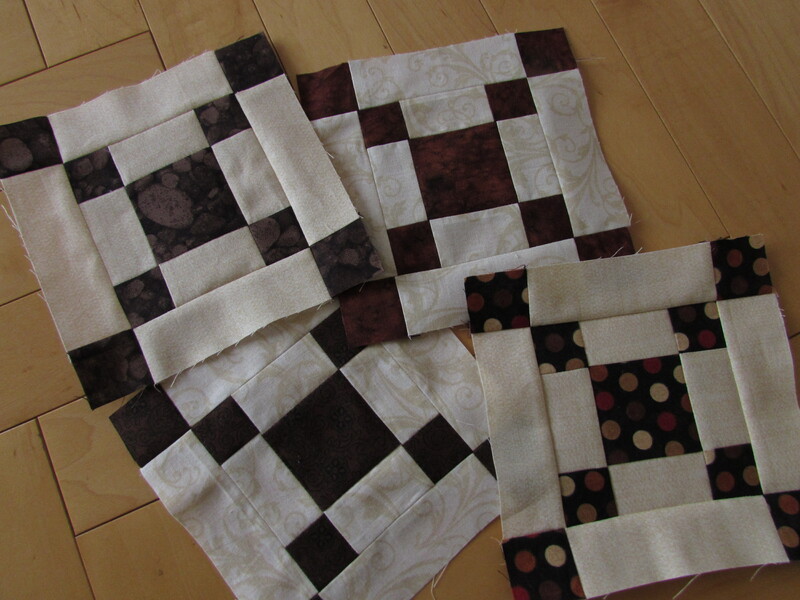 This week I have been workng on my blocks for the brown row of my Classic Stitches BOM quilt. The blocks are so cute. I started out making 3″ blocks. This was two weeks ago. My brain couldn’t deal with the small, fiddly (as Mari says) pieces. I just couldn’t come up with consistent blocks. It took me forever to get two finished. So, I gave up and went back to 6″ blocks and they are great. I will get these finished up in the next day or so and stitch them together. The last color of the year is bright green. 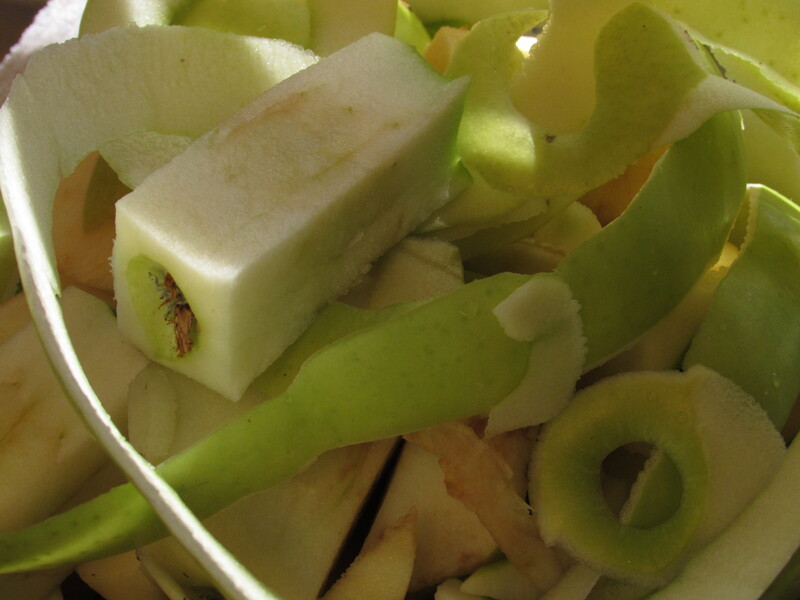 This is an easy one for me – I love green and have a big tub of scraps to go through. I need to go check in with Mari and see what sort of block she has planned for us this month. It is really crazy that we are coming to the end of this project already! 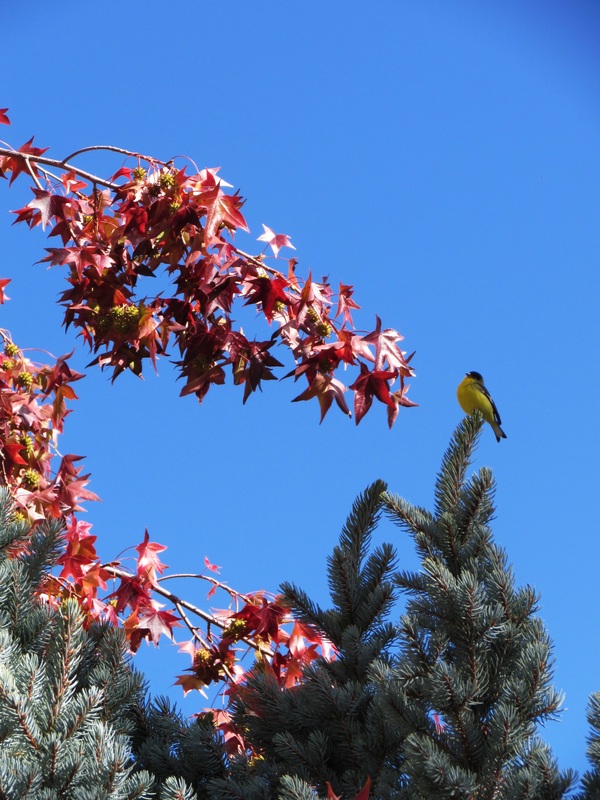 Lastly, while making applesauce today I was watching the finches. We have lots of them. This little guy settled in way up at the tiptop of our spruce tree. Hope you are having a wonderfully healthy week filled with the ordinary pleasures of life. Linking to Let’s Bee Social – the link is at the top of the page, under Link Ups. 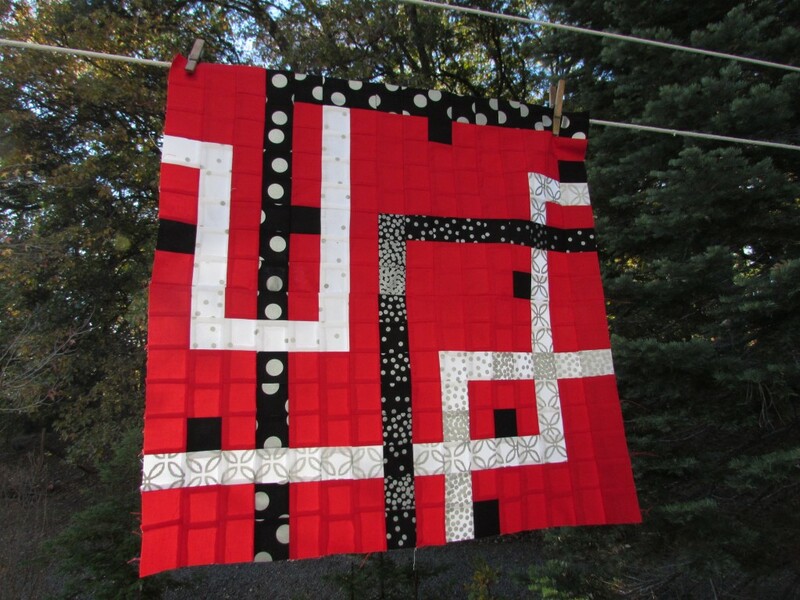 This entry was posted in Family, Gratitude, RSC Challenge and tagged Classic Stitches BOM, family, gratitude, RSC15 on November 3, 2015 by Bernie.